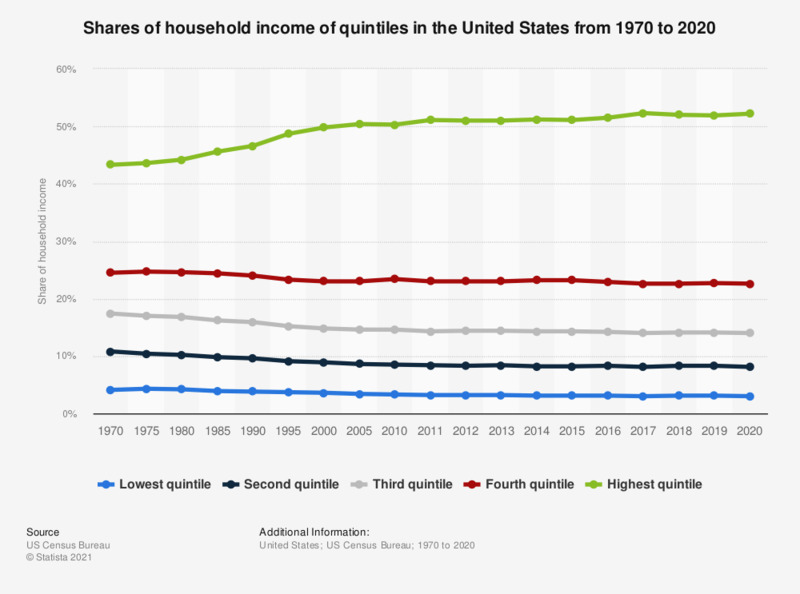 The statistic shows the shares of household income of quintiles in the United States from 1970 to 2017. About 51.5 percent of the household income of private households in the U.S. are earned by the highest quintile in 2017, which are the upper 20 percent of the workers. In contrast to that, in the same year, only 3.1 percent of the household income are earned by the lowest quintile. This relation between the quintiles illustrates the income inequality in the United States. Income inequality is a big topic for public discussion in the United States. About 65 percent of U.S. Americans think that the gap between the rich and the poor has gotten larger in the past ten years. This impression is backed up by U.S. census data showing that the Gini-coefficient for income distribution in the United States has been increasing constantly over the past decades for individuals and households. The Gini coefficient for individual earnings of full-time, year round workers has increased between 1990 and 2015 from 0.36 to 0.41, for example. This indicates an increase in concentration of income. In general the Gini coefficient is calculated by looking at average income rates. A score of zero would reflect perfect income equality and a score of 1 indicates a society where one person would have all the money and all other people have nothing. Income distribution is also affected by region. District of Columbia was the state with the widest gap between rich and poor people in the United States with a Gini coefficient of 0.54, as of 2015. In global comparison, South Africa lead the ranking of the 20 countries with the biggest inequality in income distribution in 2015. South Africa had a score of 63.4 points, based on the Gini coefficient. On the other hand, the Gini coefficient stood at 24.1 in Ukraine, indicating that income is widely spread among the Ukrainian population and not concentrated on a few rich individuals or families. Ukraine led the ranking of the 20 countries with the greatest income distribution equality in 2015.